If you do something long enough, patterns start to emerge. I’ve noticed that I tend to get the same questions from prospective clients over and over about SBA loan forgiveness. Since many people are clamoring for the same info, it’s time to write an article. How much will the SBA be willing to settle for? For you? I’d say you can likely settle for $45,431.02. Is that exact enough for you?! Of course, I’m kidding. The answer to the question is that it depends on a slew of factors. I’ll get into them in a minute, but first let’s talk about the general philosophy of a settlement from the bank and SBA perspective. To start, the SBA doesn’t settle for the sake of settling. Settlements are reserved for situations when the collateral is insufficient repay the debt in full. Beyond that, settlements are reserved for situations when the guarantor lacks the resources to repay the debt in full. The collateral is clearly worth enough to pay off the loan. Collateral can be the business assets, a commercial building, or your home. If you owe $500,000, and you’ve pledged your home that has $700,000 in equity in it, a discount on the debt will be unlikely. You have the financial means to repay the debt in full. If your business goes under and you owe $150,000, but you have a job earning $400,000 per year, and have $250,000 in various savings and investment accounts, you’ll be asked to repay the debt in full. Borrowers have asked me why the bank wouldn’t consider taking a small discount rather than go through the costly and timely legal process. It takes me back to my original statement: they won’t settle just to settle. You having the ability to pay, but refusing, does not meet the SBA’s criteria. I can fully appreciate how bad it feels to lose your entire down payment, plus whatever you sunk into the business to keep it afloat. And repaying debt on a business that no longer exists adds insult to injury for sure. But if your advisor (who has no experience with SBA settlements) tells you that everything is negotiable, and that by holding out, you’ll eventually be able to settle for next to nothing, you are going to be sorely disappointed. The SBA doesn’t bluff. They are pretty straight shooters. If they like a deal, they’ll usually accept it without haggling. So if the SBA rejects an OIC, it’s not a negotiating tactic. It’s how they really feel. Ok, I get what they won’t accept. But what WILL they accept? 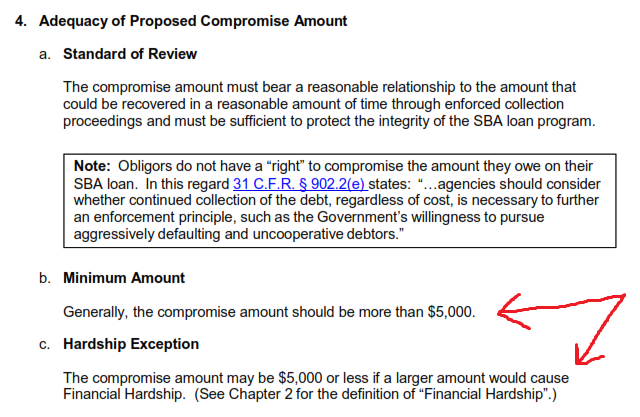 An acceptable SBA Offer In Compromise is based on the borrower/guarantor’s ability to pay. There is no set dollar amount or percentage that they will accept in every scenario. Beyond those sections, the SOP doesn’t speak to specifics regarding amounts. Rather than a specific amount, they want as much as you can afford. This is why business partners will often settle for different amounts. What about 50-50 business partners? Let’s say one business partner has significant cash savings, high income, or equity in their pledged home. The other partner is unemployed, has no savings, and doesn’t own a home. It’s abundantly clear in this situation that the “richer” guarantor will be expected to make a higher settlement offer than the poorer partner. Even if business partners each own 50% of the business, that has nothing to do with a potential settlement. The first reason, as mentioned above, is that the SBA isn’t going to be satisfied with 50% of their money. 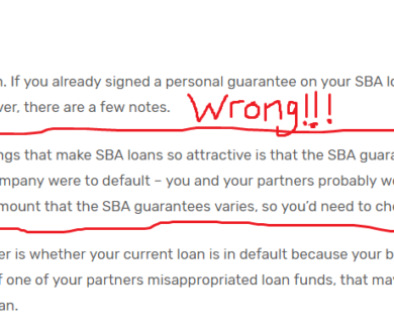 If one of the partners can afford 100% of the outstanding loan balance, and the other can afford 0%, the SBA doesn’t care if that doesn’t feel fair. Even though you might only own 50% of the business, the personal guarantee that most guarantors sign is an unlimited guarantee. This means that BOTH of you are responsible for 100% of the debt. The reason why the SBA does this is not hard to understand. Your lender and the SBA want to maximize the odds that they’ll recover their principal in full in the event of a business failure. Do I have to settle with both the bank and the SBA? 1) Your lender is servicing the loan. The reason that the SBA wants the participating lender to concur is to avoid having to review junk offers. It’s a waste of everyone’s time when the guy who has $250,000 in the bank offers $5,000 to settle. If the SBA approves the settlement, it’s for all the debt. There is no separate settlement with the bank. The bank and the SBA will work that out among themselves. 2) You got a 60-day letter. If you got a letter directly from the SBA, sometimes they will tell you to go back to your lender. If your lender has closed their file and doesn’t want to deal with the, the SBA will still take a look at it. I assume this happens because the SBA wants to have the lender do the heavy lifting when possible, but I’ve never really gotten a straight answer. If the lender doesn’t want to be involved with the OIC, it’s my understanding that there is an agreement between the SBA and it’s lending partners that delegates decision making authority to the SBA. Any decision made by the SBA will is binding with the lender. There is one caveat to the SBA making the decision. If your home is pledged as collateral, the participating bank will need to release their lien. The SBA can’t do it. In situations like these, I always go back to the lender who holds the lien to make sure they are on board. The last thing you want is to write a check to SBA, only to have the lender stonewall you. So, what exactly is the relationship between the SBA guarantee and an Offer In Compromise? When an SBA loan is approved by a preferred lender, the SBA pledges to reimburse the lender if the loan goes bad. But the guarantee is not, well, guaranteed. The SBA counts on the lender to follow proper due diligence. If the bank is found to have not followed proper protocol, the SBA can discount a guarantee (known as a repair) or completely void a guarantee (known as a denial). Does a repair or a denial impact what the guarantor owes? No. The payment or denial of a guarantee has no impact on what a borrower owes. Either way, the borrower is liable for the entire loan amount (unless the guarantee is limited, which is unlikely). Is SBA loan forgiveness taxable? 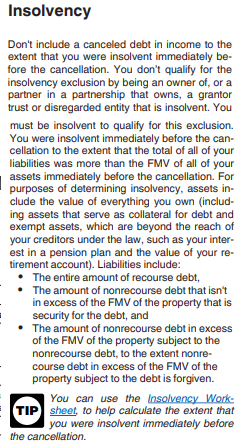 If you meet the IRS definition of insolvency, you might be off the hook. The IRS does have offer guidance on this topic, and there are a number of exceptions and exclusions. The one that I find has been most applicable to my clients is the “insolvency exclusion”. The basic idea is that if you have a negative net worth, you’re insolvent. Even if you are not insolvent, a 1099 may still not come your way. This gets a little nit-picky, but hang with me for a second. Let’s say for a moment that ABC Company LLC is the borrower, and owes $1,000,000. In order to get the loan, 25 guarantors were required. If the business goes under, and you settle your personal guarantee for $20,000, you may not get a 1099 for the balance if collectively, the other 24 guarantors end up repaying the debt in full. 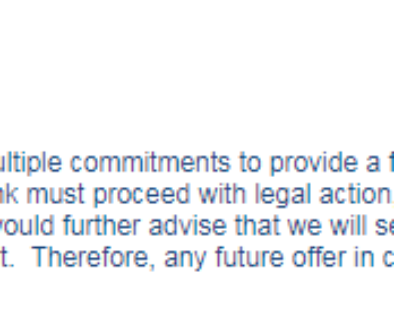 My point here is that being released from a guarantee isn’t always synonymous with a settlement. Another note here is that if your settlement calls for monthly installments, a 1099 usually isn’t issued until all the payments are received by the lender. It’s important to remember that if your business likely experienced losses. In some cases, huge losses. So if you lost $500,000 on the business, and you do get a 1099, you can offset that income against your losses. Finally, even if you do get a 1099, the resulting tax liability will still be less costly than having to repay the debt in full. 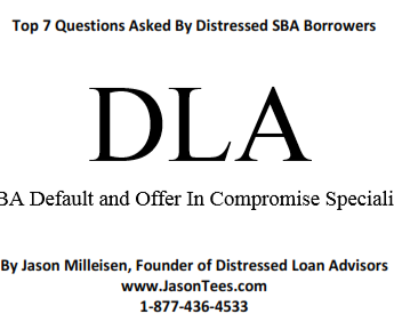 Will I be eligible for another SBA loan if I’m approved for an Offer In Compromise? Not any time soon. They are going to put you on the CAIVRS list. It’s basically a “blacklist” of people who have wronged the government in some financial capacity. The SBA writing off a portion of your loan balance will certainly land you on CAIVRS. While it stinks to be on the CAIVRS list, it shouldn’t deter you from attempting to settle. A successful Offer In Compromise isn’t what lands you on CAIVRS. Defaulting on your SBA loan in the first place is what lands you on CAIVRS. In other words, unless you repay the debt in full, you are going to be on the list. In addition to SBA loans, there are other types of federal financial assistance that you won’t be able to get. FHA loans (a type of residential home loan) and federally subsidized student loans will also be unavailable to you. Do I need an attorney to assist with the SBA Offer In Compromise negotiation? Before I answer this question, let’s get something out of the way. Anyone who gives you advice has some kind of bias. So if you are thinking “of course you are going to tell me that you don’t need an SBA default attorney!”, I don’t. But hear me out. If your business is closed or on the verge of closing, and you are madly searching the internet for information. You’ll may start Googling phrases like “SBA default attorney” or “SBA settlement attorney”. Assuming you need an attorney is common. The SBA doesn’t require a borrower to retain an attorney to settle. Most banks don’t involve their attorney unless settlement negotiations break down. SBA Offer In Compromise is typically handled by non-bankers, both at the bank and SBA. When I worked for the largest SBA lender in the US, there was not one single person with a law degree in the workout department, and we reviewed and negotiated hundreds of OICs worth hundreds of millions. The SBA has very specific protocols and methodology. If you attorney hasn’t handled an SBA settlement before, you’ll be at a major disadvantage. Just recently, I had a new client who had previously had an attorney assisting him. The attorney was trying to negotiate a settlement BEFORE the business was closed, which is a pretty gross misunderstanding of how the SBA operates. So when would hiring an attorney make sense? If you are being sued. I can’t help with that, and I would never represent that I could. Once a settlement is reached, I always recommend to my clients that they have an attorney review the settlement documentation for adequacy. My bank sent me forms for the OIC. What can you do for me that I can’t do for myself? I get this question in various forms several times per week. Some people are pretty blunt about it, others are more diplomatic. Either way, I’m never offended. I charge money for my services, so it’s perfectly fair to want to understand what value I bring. I had a 10 year career in banking, with the last two being a workout officer for the largest SBA lender in the country. I started the job in 2008, when the financial crisis hit, resulting in an unprecedented number of SBA defaults and requests for forgiveness. Since 2011, I’ve been a full-time consultant, handling nothing but SBA loan settlements. The SBA has a unique process, unlike other types of debt. After handing a few hundred of these, I know the process well. There is an order to things, and if you don’t understand what is supposed to happen when, it can feel insurmountable. There are certain things you can push back on, and other things that you just have to live with. Knowing the difference can mean the difference between settling and not. I have a keen understanding of what matters most to the SBA, and what they are looking for on the SBA Form 1150. I’ve had people who have come to me after attempting to settle on their own. After reviewing what they presented, it’s usually clear to me within 30 seconds why the offer was turned down. It doesn’t make me smarter, just more experienced. The analogy I always used is the kitchen renovation. If I wanted to renovate my kitchen, I could hire someone, or I could do it myself. If I have absolutely no experience with home renovations, could I do it? Maybe, but will probably make some major mistakes along the way. It’s not that I’m incapable of learning, I simply don’t have the experience needed to know the right way to do it the first time. Alternatively, I could hire a contractor. Does that guarantee that everything will go 100% as planned? No. But does someone with a decade of experience doing the exact thing that I need done have a better chance of a positive outcome? For sure. Same deal with me. I’ve worked on hundreds of these, and that experience gives me insights you can’t pick up just by reading my blog.